For ultimate flexibility, Gunnebo Lifting offers three distinct alloy steel connecting link systems to fabricate alloy steel chain slings. The systems include the traditional G Style Mechanical Connector, the BL or Berglock Clevis Connecting Link, and the Half Link SK System. Like all Gunnebo Lifting alloy steel fittings, the Grade 80 & Grade 100 alloy steel connecting systems feature superb strength and elongation characteristics along with arguably the finest finish quality in the industry. Each piece has full heat lot traceability and is proof loaded to 2 ½ times its minimum breaking strength. The G style mechanical connector is designed to couple lengths of alloy steel chain with matching fittings and appropriate master links. Special attention to dimensional detail allows the link to accommodate the largest variety of proof-tested, certified Gunnebo Lifting alloy steel lifting components available anywhere. 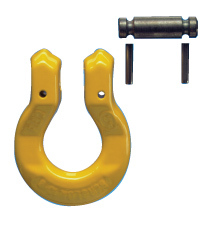 The BL or Berglok Clevis connecting link, first introduced by a Gunnebo Lifting company in 1976, allows the fool-proof assembly of grade 80 alloy steel chain systems, thanks to the engineered flats found on most Gunnebo Lifting eye hooks and master links. The Half Link SK system allows a large variety of master links, hooks, and swivels to be directly jointed mini-systems that do not always include chain. 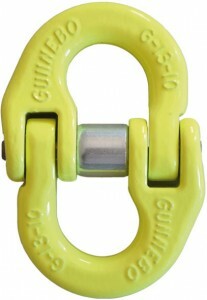 The SK system also allows synthetic and chain slings to be joined into a single lifting arrangement.